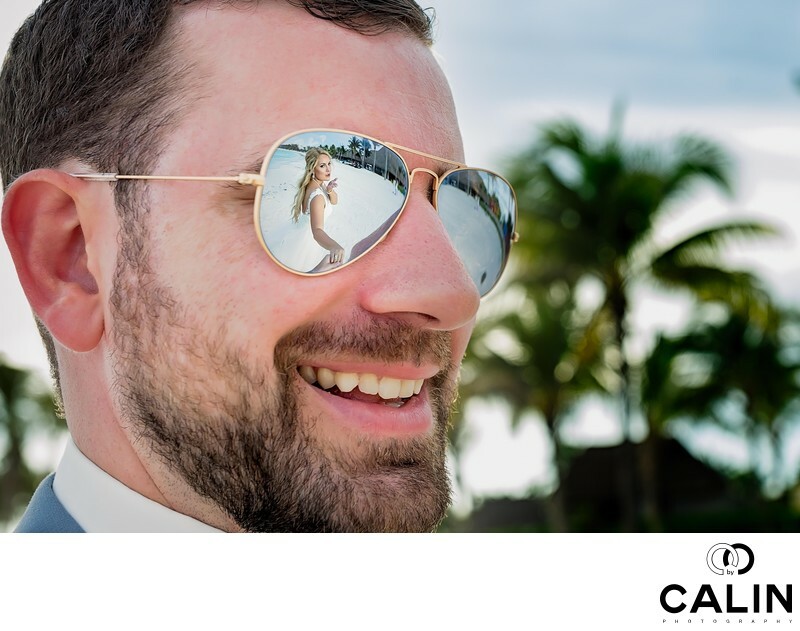 To say that I love this photograph taken at a Barcelo Maya Palace Deluxe wedding would be an understatement. As a Toronto wedding photographer, I'm usually under severe time constraints when creating new photographic concepts is a luxury I don't have. However, at this particular wedding the bride and groom gave me enough time to execute my ideas. The result? A collection of gorgeous wedding photographs the bride and groom will cherish for years to come. For this wedding photo we went to the Marina Beach close to Capt. Morgan Grill. If you haven't visited Maya Caribe Beach, don't hesitate. The white sand beach is virtually deserted all day long which in my case helped me capture beautiful pictures without any tourists or staff interfering. I to this image not too long before the sunset when the light was beautiful and soft. I noticed that the groom was wearing this very reflective pair of sunglasses and I decided to take advantage of those. As such, for this photograph, I asked the bride and groom to hold hands. Afterwards, I invited the bride to breeze an air kiss towards the groom. To capture this image I used an 85 mm lens shot at f2.5. The shot showcases Taylor, the groom, smiling at his wife. His sunglasses act as a reflective framing devices emphasizing the bride. The groom is placed on the left of the frame. To achieve visual balance in the photo, I framed the image so that I included a few palm trees on the right-hand side of the photograph. The bride, literally framed by the groom's sunglasses frames is placed according to the Golden spiral, which makes it clear she is also a main subject in this wedding picture. In post production I only burned to the sky so that the bride and groom become the brightest part of the picture. As a photography rule, the subject should always be brighter than the backdrop so that the viewers eye travels directly to the subject.